Aug 22……the meaning of scrap.. 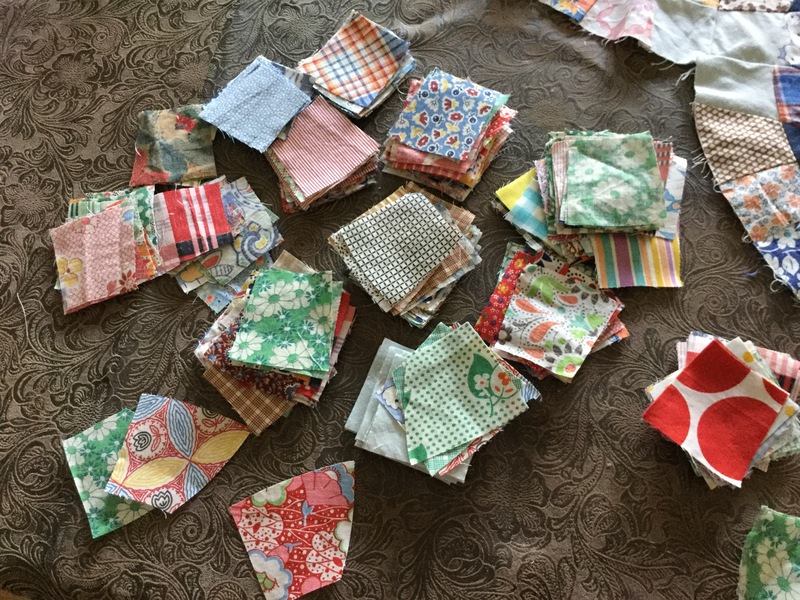 I have this problem of discarding little pieces of fabric,also accumulating from others their rejects…I so enjoy the colors of a scrappy quilt while the last quilt top I put together was pretty, it isn&apos;t a delightful display of colors like the log cabin…. Here are some scrappy knotted quilts that are finished. I have been having some back issues  ,puts me in a chair for a few days. I don&apos;t mind a chair for an hour or two but after awhile I get really disgusted with sitting… so I put my office chair at the table ,got the scraps out that I found,cleaned and ironed, and started cutting these strips into little fan pieces. I need to decide if I want to use the cream fabric or the barn red.. I like both .. although I think the red brings out all the colors of the shirting fabric, where some of the shirting gets lost in the white. What do you think? The weather wasn&apos;t perfect for seeing the eclipse ,as the storm clouds kept getting in the way. I found that it was still beautiful. I needed to always look though the camera on my iPad as I didn&apos;t have glasses . Love the reflection of the sun ,moon in this photo. 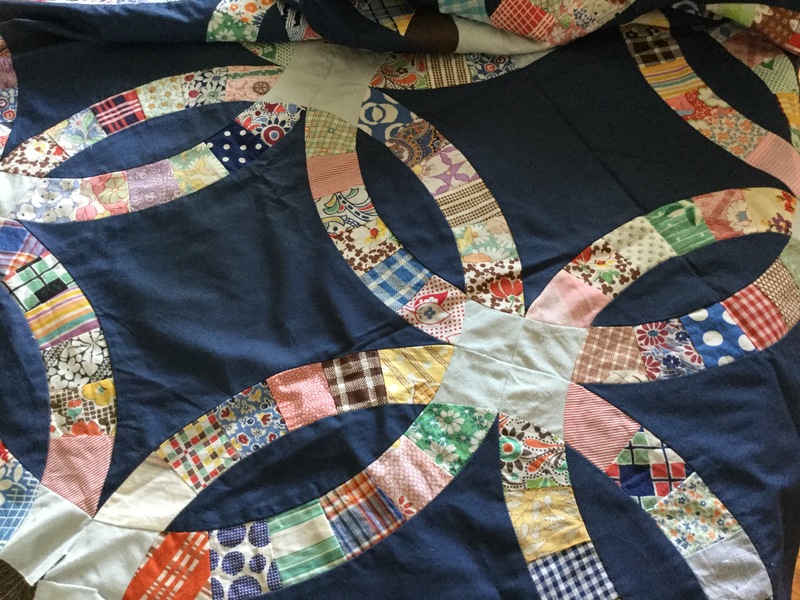 This entry was posted in quilt, scrappy quilt top and tagged clouds, log cabin, quilt, scraps, sewing on August 22, 2017 by Deb. As a young teen into my early married life ,I did a lot of mowing with tractors, when the oldest boys were old enough to mow I had them do the mowing to help keep them busy. Now I&apos;m back to mowing my own yard again … but time brought changes to the type of mower. We have a zero turn lawn mower, which looked so easy as Russell maneuver that mower over our large yard. Oh wow was I in for a surprise!! The instructions never mentioned to handle the bars with a very light touch,and I liked to make my self seasick until I learned that light touch! I am pride to say that I have learned to handle it in a more productive manner. My daughter LouAnn and I went to some yard sales recently, a fun time of trying to find that little treasure. Oh how I found it!! I was so delighted when I found it. It was old balls of fabric in a lovely old jar. Here are some soaking in the sink in baking soda and laundry soap. I hand washed them then put them in the dryer .. I had many little pieces to iron which I worked on when I needed a little break from other work. There were many pieces that looked like they were from a shirt factory, I believe that they are vintage maybe dated at 1940&apos;s to 1950&apos;s . If any one knows for sure of a date let me know,I would be pleased to know . I have been working at this top again.. I had to make some changes as I didn&apos;t have enough of the one fabric . There were two pieces to be used but I thought maybe they would clash some for the pinks are just a little different so I was hoping that I would have enough of the one .. not so. It not going to look too bad. Now off the decide what pattern would be nice to use the old scraps in….. maybe a tree of life or a grandmothers fan….. 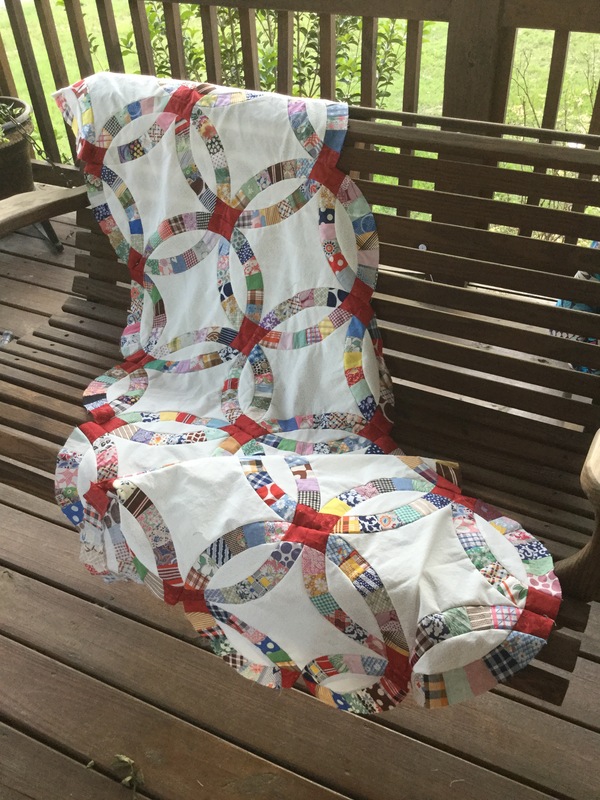 This entry was posted in sewing, vintage and tagged quilt, scraps, sewing, vintage, vintage fabric on August 1, 2017 by Deb. I received a pile of scraps. Ok, so your thinking what’s new ,that poor dear always has a pile of scraps. And boy are you right!! Last weekend an older gentleman from our church ,who to keep himself busy, cuts up fabric into 6″, 5″and 4″ that people give him. He does this to support a program that helps poor widows support herself and her family. The widows will receive these blocks with batting and backing, they then will make quilts to sell. 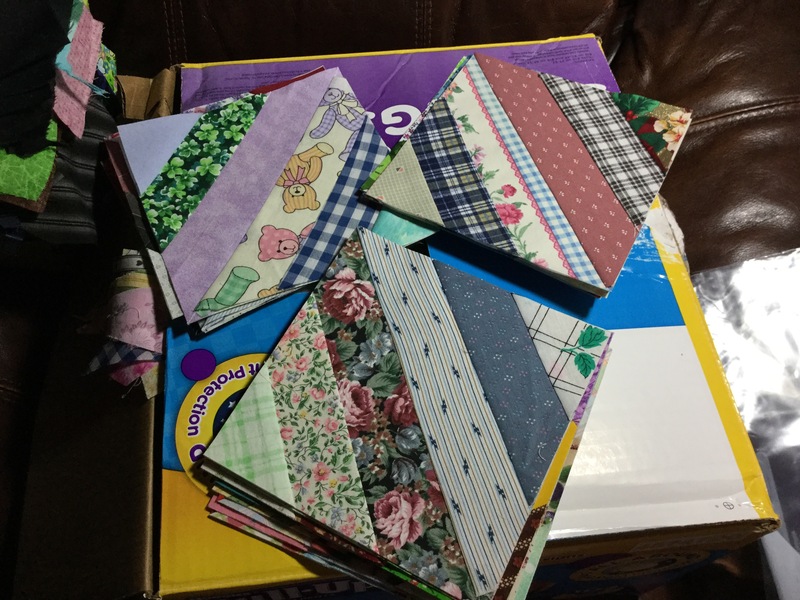 To make a long story short… He brought me his scraps to put into quilt tops for Christian aid ministries. Of course.. I can’t say no. 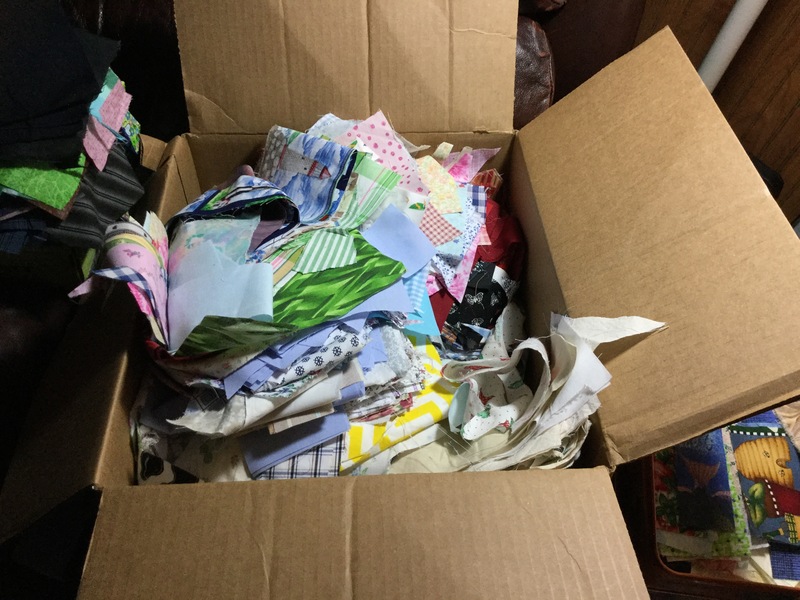 Here’s the big bag of scraps,which I dumped into this box. I want to go through to sort the big pieces from the little . I made a few blocks like this to see if I cared for them. I believe it will make a nice top. This is what I’m going to work on this week, the weather is to be hot for awhile now.. time to keep myself in except for early mornings. I was messing around in my fabric closet,digging down under looking for an old briefcase that I wanted to put my art stuff in to keep it all in one place. 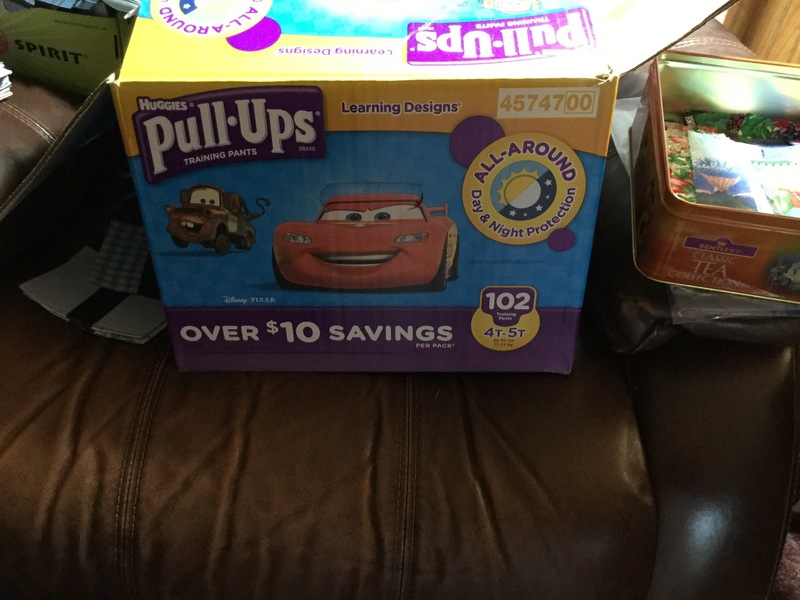 I got a surprise…. the old case wasn’t empty. Guess what was in it!! No not a mouse nest!😜 an unfinished double wedding ring top. There are two rows of four blocks to a row. It is in vintage fabric except for the navy blue . Plus there are lots of little pieces ready to be pieced. I had the life scared out of me Saturday… I went out to do some watering , I have some small oak tree starts that needed a good soak, well.. when I first grabbed the hose to fill up some pails I thought heard a raspy noise .. looked around .. saw nothing ,continued to work ,when all of a sudden Wiggles ,our Jack Russell came unglued!!!! Not more than 3 feet away was a rattler!! Needless to say it’s history. 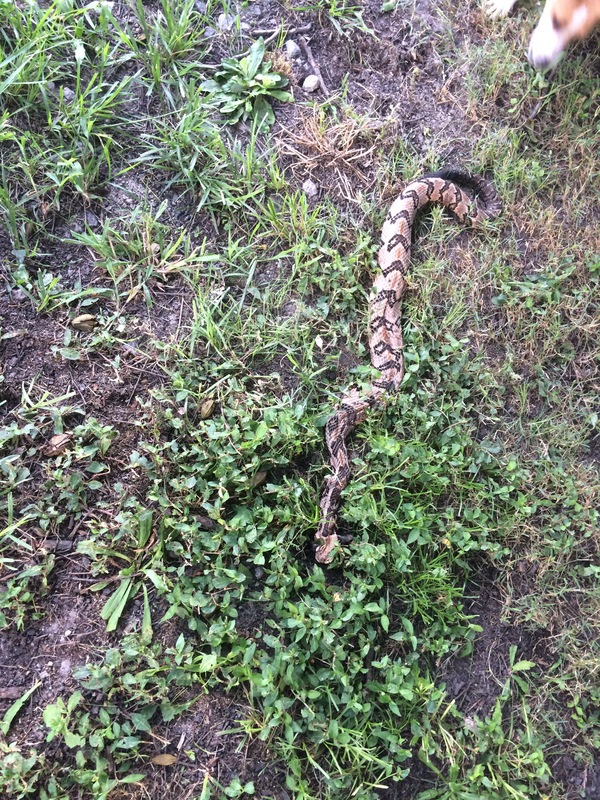 Can’t say I care for a rattlesnake right outside in my front yard. 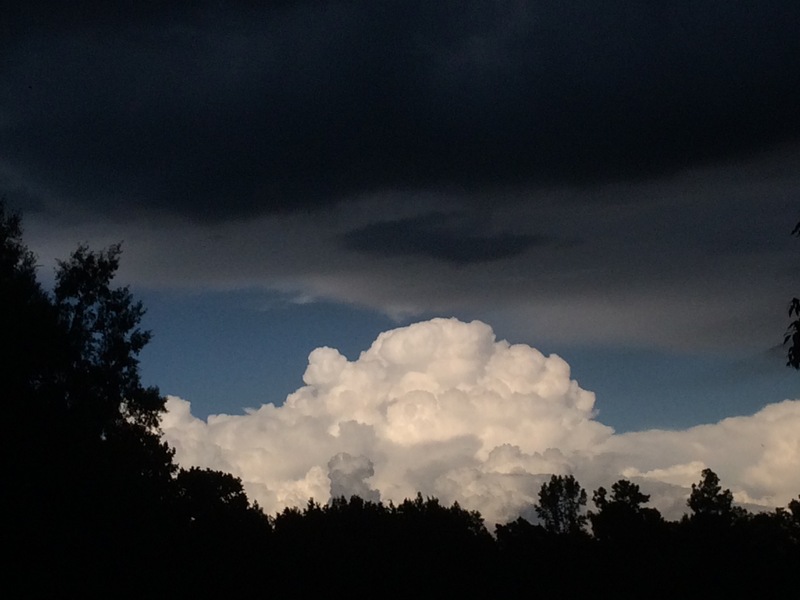 We had a storm pass through this evening ,the clouds were beautiful! This entry was posted in scrappy quilt top, vintage and tagged clouds, quilting, scraps, sewing, vintage on July 17, 2017 by Deb.